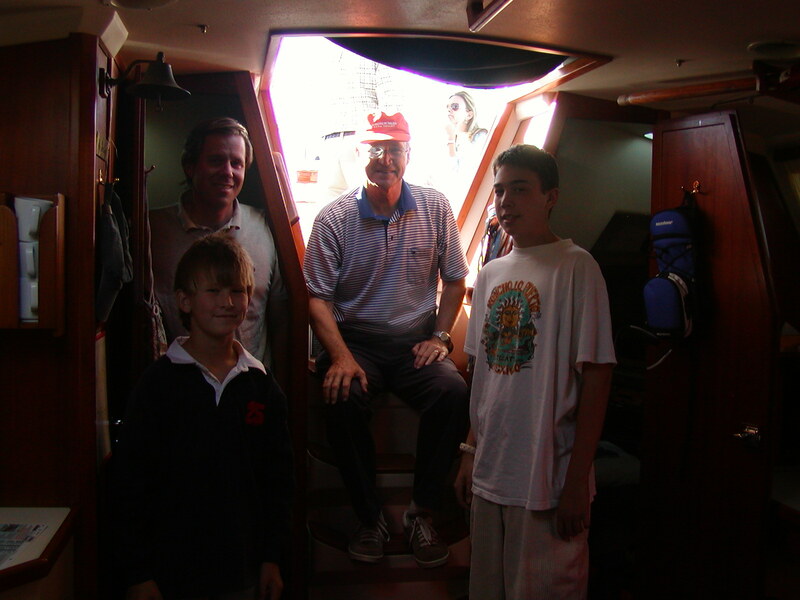 Leaving Marina del Rey, Nov. 3rd, 2003. This week was punctuated by excitement, lots of work, and lots of family and friends. We cannot thank everyone enough for the gifts, the visits, the help, the advice, the hugs, the bottles of champagne and other libations received. 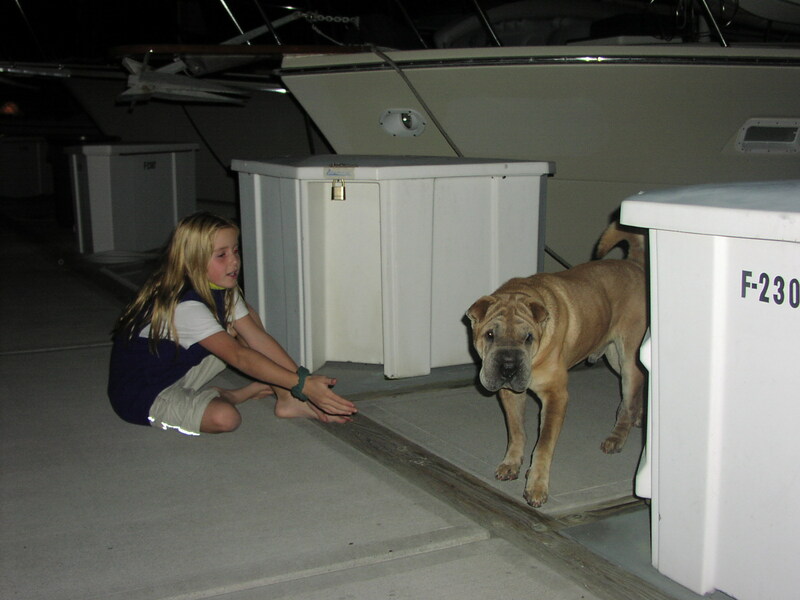 Meagan had to leave the dog she had befriended while we lived there at the California Yacht Club. His name is Captain and he is the pup of the President of Motion Picture Industries. She didn't care! The dog and the owners were wonderful. She will miss them greatly! Party night! We fed some of the stragglers after the party (mostly relatives!). Stan Wetch's children on left, then John and Susan Reid, then Kelvin and Meagan, then Wendy Reid (cousins). Tom Armstrong was invaluable to getting out on time. 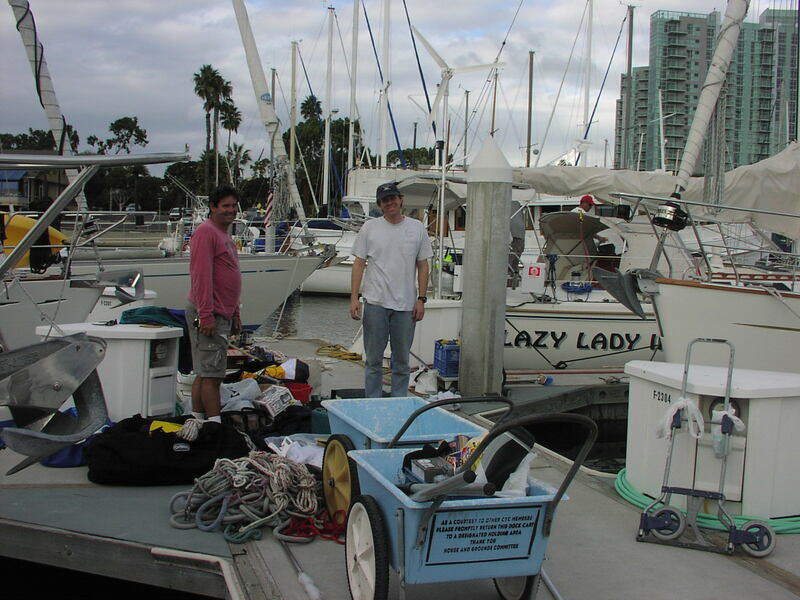 He flew down from his home near Sacramento, had dinner with us the night before the party, and then helped all day with ice, vendors, putting things on the boat and taking things off the boat. 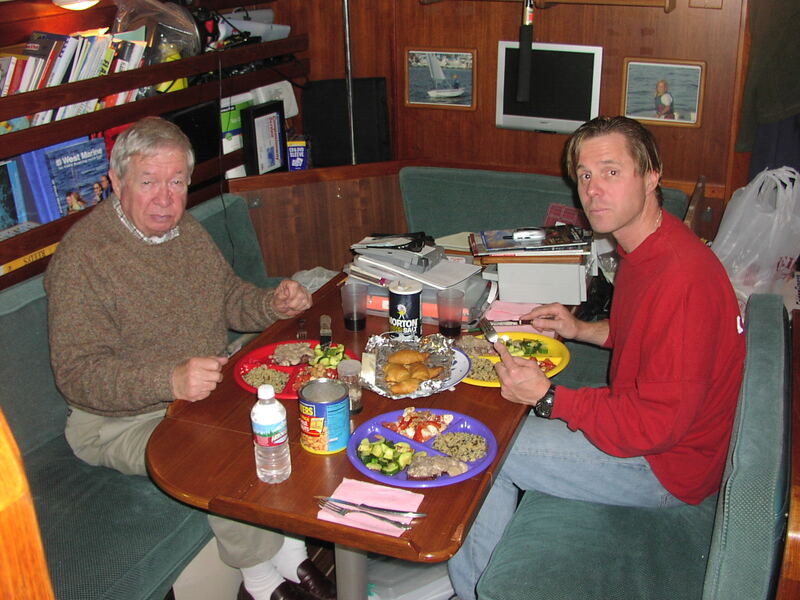 We then had a great dinner at the club with Mark's sister Janet and her husband Jack, Tom Armstrong (Mark's step-father) and Mark's dad, Kelly. 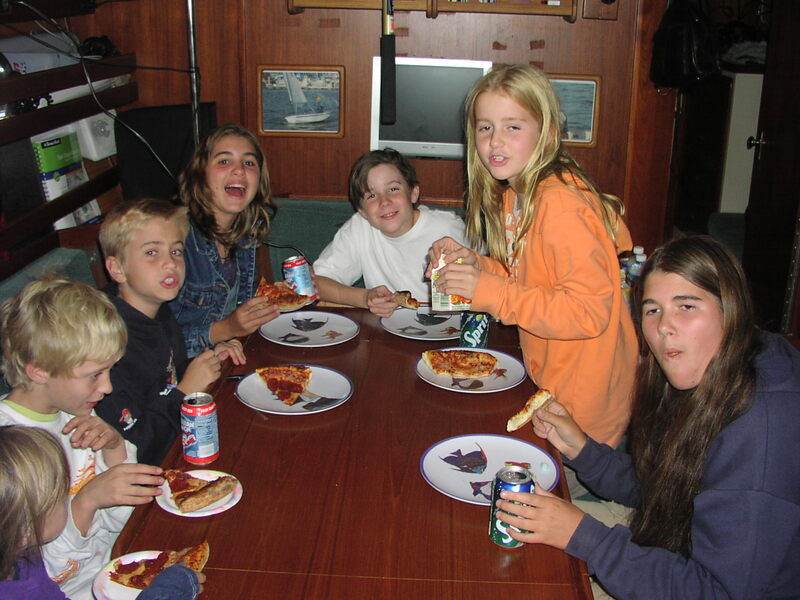 Kids ate pizza on boat. Our last Sunday at church was unbelievable. There was a presentation during chapel and Mark was presented with his own bible from the Vestry with his name embossed on it. Then, there was a wonderful banquet for our family after the service. We were very touched and most appreciative. 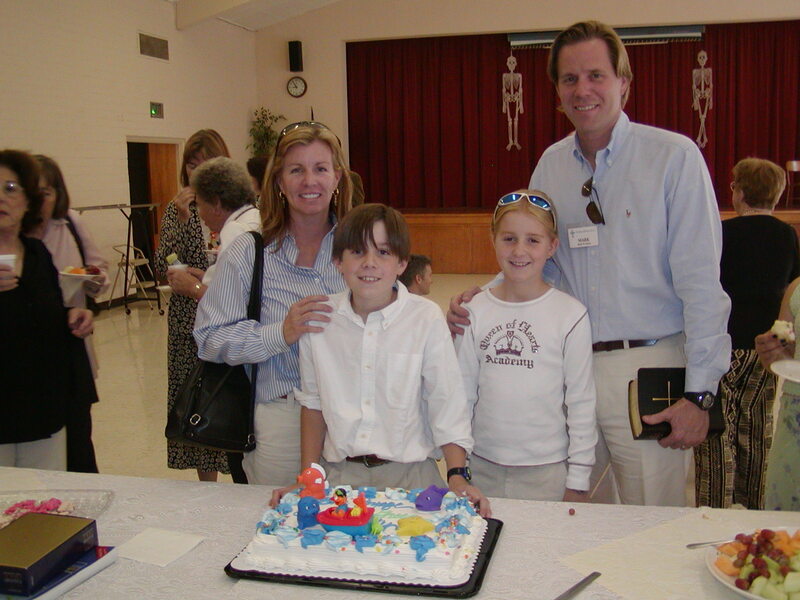 Though two other friends have agreed to take over Mark's last and final year on the St. Francis Episcopal Vestry for 2004, he still holds the title, as well as head of Stewardship. We will miss our family and friends from this community that we have been a part of since 1991. 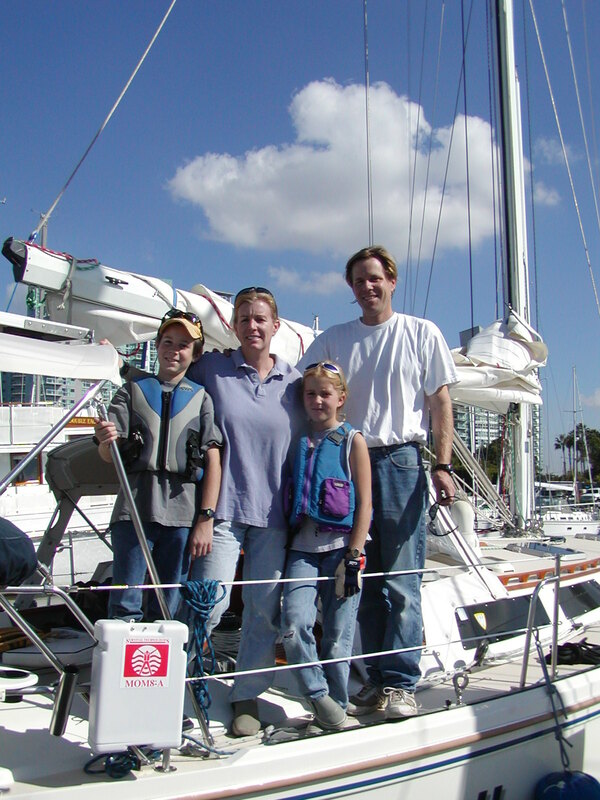 Our farewell photo, taken the morning we left Marina del Rey. Do we look a bit pasty to be doing a trip to the tropics? 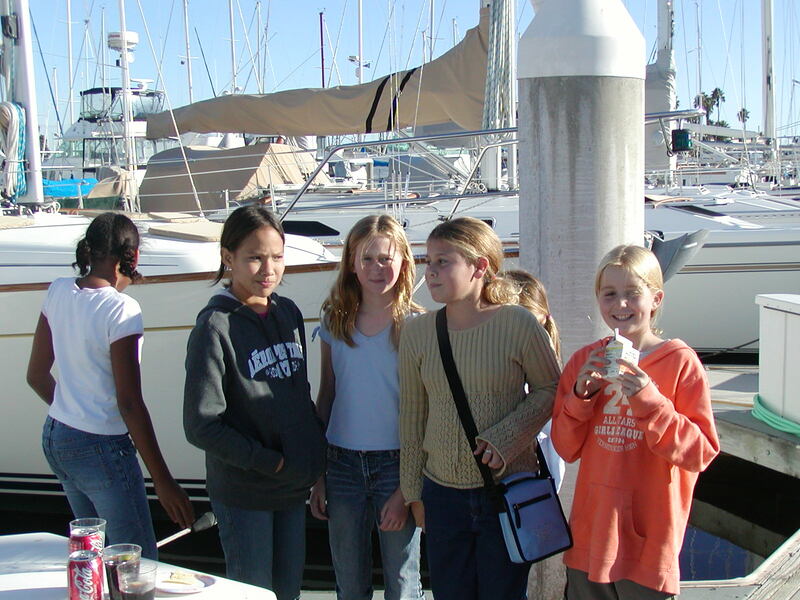 More friends and family at the dock-side party Nov. 2nd. Mark, Tony Browne, Alex on right and Lucas down in front of Mark. Thanks for coming! One of he most wonderful and unexpected gifts was from Linda Schwarzkopf. Linda not only came, and gave us a great bottle of Champagne in a unique wrapping, but she brought her daughter Savanna, and several friends from Meagan's 3rd grade class (two years ago!) 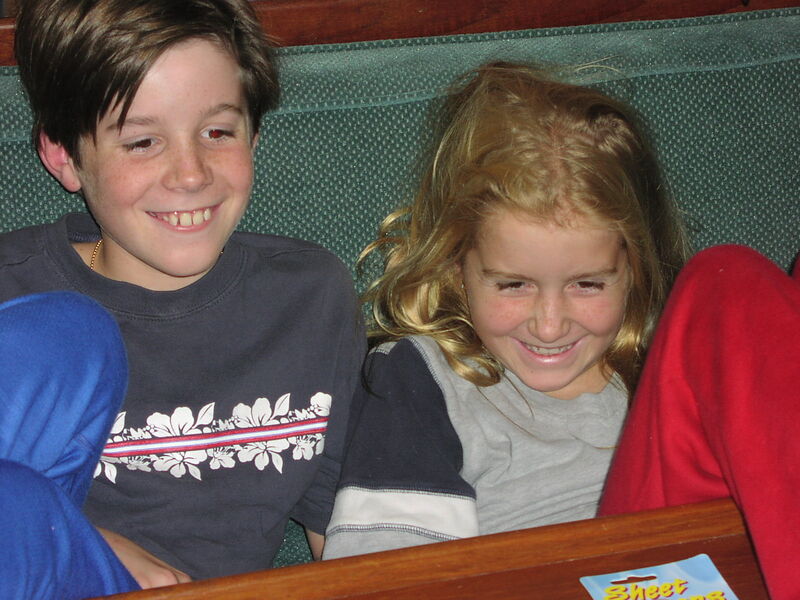 from First Lutheran School of Torrance. What an amazingly wonderful and selfless thing to do. All for Meagan. She was so happy and so excited. Thank you Linda! Hope Savanna has gotten letters from Meagan already! Cousins Susan and Wendy Reid hanging out in Meagan's cabin. 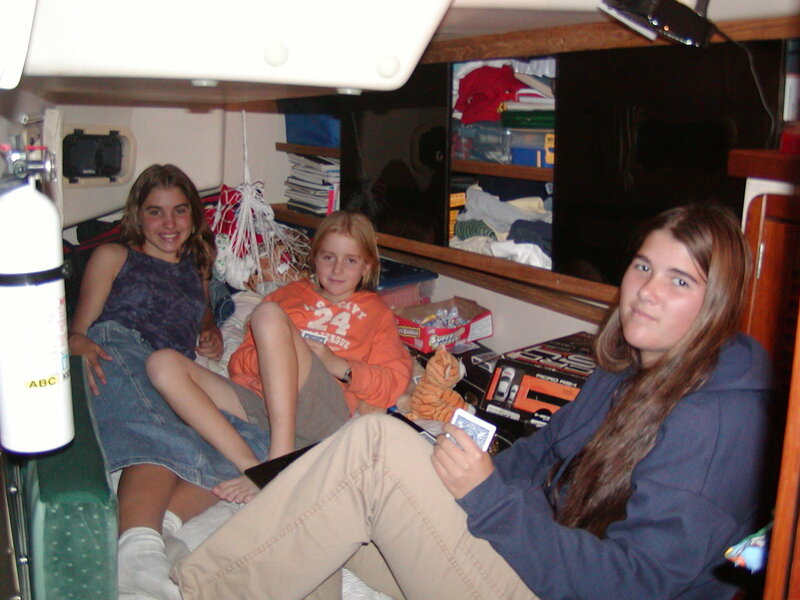 Not too shabby to have your own cabin on a 42 foot boat, huh? Kelvin and Meagan watching the universal baby sitter: The DVD player on the main salon's table. Yahoo, psuedo-TV! We have spent way too much on DVDs for this trip. We have probably seen all of them already just having the kids kept busy while we work to get out of here for points south. Oh well. The rest of the trip is fishing and homework!